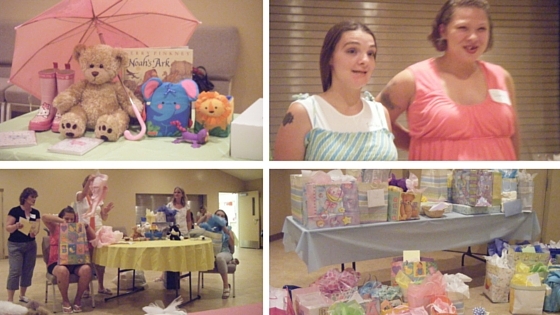 Although from all appearances, it appeared to be an “ordinary, normal, suburban-church-style” baby shower, this baby shower was anything but. This baby shower was the result of a discussion with the local women’s shelter director who had called me one day, knowing I was always on the lookout for ways that our ladies’ group could serve the community. She had told me there were two ladies at the shelter who were both pregnant, and even though they both had older children, neither had ever had a baby shower. So I broached the subject at our group’s next meeting and when I did, was pleasantly surprised at the level of excitement! It was more than I could have hoped for as we unanimously decided to throw our support behind these two ladies who were complete strangers to us. Those who were gifted with decorating jumped in to create a Noah’s Ark nursery atmosphere. Those who were gifted in hospitality jumped in to coordinate the refreshments. I helped plan a couple typical, fun baby-shower games. Everybody had a job to do. The plans were set. On the day of the shower, when the guests of honor arrived along with other ladies from the shelter, the shelter director, and assorted family members, we welcomed them, and then cheered as they opened the mountain of gifts! Diana, who already had four children, was expecting a girl. And Jenifer, who already had two, was expecting a boy. Afterward, everyone pitched in—our guests from the shelter and those of us from my church—which made light work of the clean-up. The chatter was happy and easy as we helped the gals load up their presents and said our goodbyes. And when you spend worthwhile time together with people who may share little else in common with you, they just may catch a glimpse of Jesus” (from The 9 Arts of Spiritual Conversations 8.1: Why Serve Together). I’m not at all biased! Great article, Kim!